Good news - a new charity called LightAware has just launched. Please visit their crowd funding campaign and watch the brief cartoon here https://chuffed.org/project/lightaware. Please share and encourage donations. Please also follow their Facebook page by searching for LightAware Charity on FB. Share this far and wide with as many people as possible in order to help grow this movement towards finding a solution to the lighting problems that we all struggle with. Current charity website is http://www.lightaware.org/ but far more support is needed to expand on this. Hi all. I also have eyestrain from all LED screens. I am 32, Male. Working in sales. Have glasses prescription for distance but this is it. My eyes are fine. This problem is hard to diagnose. I will try to summarize. 1)	LCD display Samsung SyncMaster P2350 connected to VGA output of NVIDIA 8300GS or ASUS EAH5450 cards (Windows 7). 2)	Dell Inspiron 1420 laptop with LCD screen (Nvidia 8300) – can work whole day without eyestrain (Windows 7). There is also Acer Aspire One from 2012 with intel 2000 and LED screen but I can use it for 3-4 hours before my eyes are tired (Windows 7). Eyes feel more comfortable using UBUNTU on this laptop. Maybe because of darker color scheme. All new LED screens kill my eyes in 20 mins. Now the interesting part begins. 5)	My phone Huawei PE-TL10 has LED backlight and gives me pain in the eyes, problem is partially solved with blue-light filter glass protector. I am not watching movies on it anymore. Nobody around me has these problems and everybody is very happy with their new Macs and PCs. Btw, I have eyestrain and pain using LED bulbs and lamps. All other light sources are fine. I tried few flicker-free, low blue light monitors like ASUS and Benq last year but no success. After 20 mins, my eyes are red and tired. Ordered Jins PC glasses – same. This is a big mistery to me. Alexmam I should mention the Nexus 5 also has an LED backlight so that's an LED thing that works for you. Thanks for sharing your experience Alexmam. This is a very enigmatic issue for sure. I basically cannot handle any LED monitor either. Anyone in the office that has one, I almost always convince them to come to my desk instead. If I don't, I will have an ocular-like migraine for pretty much the rest of the day. The pain is almost immediate when I look at their monitor too. I visited an neuro-ophthalmologist this month, and in dilating my pupils and looking in, he said my retina and head of the optic nerve looks OK (that's good at least! Good to know these painful monitors aren't causing any eye damage). He suspects the pain is actually coming from the brain (like the visual processing center). Some of his associates have said that some people have gained some relief from the FL-41 tint. I think a company called Theraspecs in the US makes them. It's also been suggested that I may have a form of Irlen Syndrome (Scotopic Sensitivity Syndrome). I'm a bit skeptical, but it at least makes sense in theory. For now, I'm just sticking with my U2410 LCD monitor on 0% brightness with f.lux enabled. That seems to be the most tolerable thing I have found so far. I can use an iPhone 6S+ fine for a few minutes each day as well. That doesn't seem to bother me as it does some others on here. Alexman thanks for posting your experience. It certainly rings a bell with many here. and It deservers its own thread. Does anyone own laptop based on AMD? Do you also get eyestrain from it? 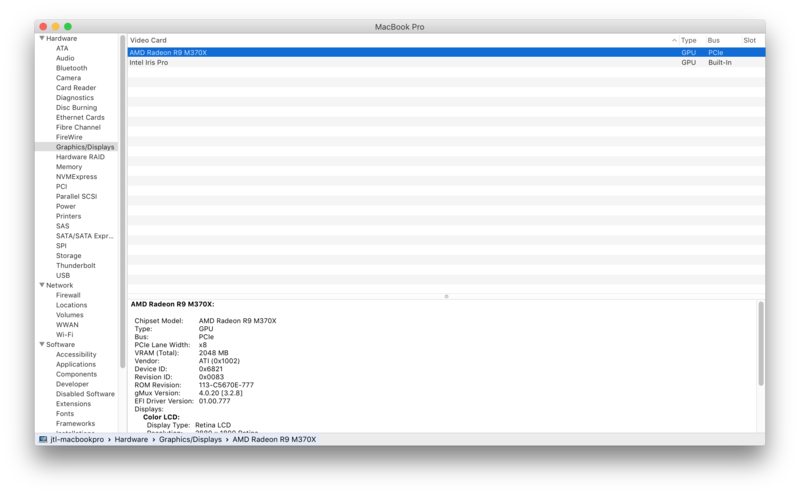 Alexmam Well I have 2015 Macbook Pro with AMD graphics chip. I am only sensitive to PWM though. JTL CPU is AMD too? Alexmam Apple has never used AMD CPU's and I think AMD cpu's are slow. But I think that would have nothing to do with quality of graphics as I've seen laptops with the same AMD GPU but Intel or AMD CPU. Alexmam All Macs use Intel processors. JTL in Intel based laptops CPU integrated graphics is used for office tasks and video card used for 3D. I am wondering how it is done in Apple. Alexmam Apple uses a hardware multiplexer chip (like the input select on a TV) to switch between GPU's, as in the display is hooked up to this chip. All external graphics ports are hardwired to the AMD graphics chip as well. I am trying to understand if buying AMD based laptop will solve my problem. Intel drivers definitely give me eyestrain. Alexmam Although I don't have the same problem I can sympathize. I have changed Intel driver on my Acer Aspire One from 2012 with intel 2000 and LED screen to Standard VGA Adapter driver and stopped having eye strain from this laptop at all. Now it is clear, that driver is the problem for sure. JTL I use only office and Internet on my PC, barely watch movies so I am fine with it. I wonder what it is about the driver that causes such issues. Is it temporal dithering? Is there a way to see temporal dithering in action? MagnuM I don't know what happened with all drivers but manufacturers obviously don't care.